He was just eight years old the first time he was incarcerated. A baby really, a sweet innocent boy whose worst crime was being born to parents who couldn’t figure out their own lives. A typical youngest child, he was the family clown. Always sporting a bright smile, always wanting to please, he was adored by his oldest sister. She, at 10 years of age when he was born, thought of him as her responsibility, as her “baby.” She would wake at night to feed him when no parents were home and tried to fill the gap as best as a young girl might. Neglected, physically and sexually abused, his life had been one of constant shuffling back and forth between divorced, alcoholic parents, who gave little supervision and no direction to this growing boy. Shuffling, that is, until at six years of age, when his mother went out one night with a boyfriend and did not return. Eventually the food ran out for the children. His sister asked a neighbor to call the authorities and report that they had not had a parent in the home for about a week, and they had nothing to eat. One would have thought things could not get worse. But oh, this was just the beginning of the descent. How do you tear apart four children whose only safety net was each other? There was no room in one foster home for four children. His oldest sister, now a teen, would have none of it; she disappeared from his life as she went off to fight her own demons. His only constant was gone, as his life majorly changed. Christmas? It was too close to Christmas to accommodate four more children. There would be no Santa Claus, no gifts, no Christmas cookies or Christmas cheer. He must be a very bad boy if Santa isn’t coming. It shouldn’t have been a surprise to anyone really, when at eight years old, Jimmy became the youngest ever boy at Arizona Boy’s Ranch. You might wonder what crime an eight year old could commit to warrant incarceration. He was a chronic “runner.” He wasn’t running away, as much as he was desperately trying to run toward a better life; toward the life he should have been given. For this he was labeled incorrigible and locked up with teens the size of men with serious criminal backgrounds. This little boy’s path went from bad to worse. The stories he tells of his time here will make you cry. At nine years old, he visited his sister for Christmas. Newly married, in her own home, she and her new husband had cut down a Christmas tree. Never having done this before, they found a spectacular tree and chopped it down to discover that, because the tree had grown against another tree, the backside was completely bare. The tree was beautiful from the front, so they took it home and placed it against the wall. Jimmy was so excited as they decorated the tree. When it was all done, they placed the angel on top, turned on the lights and stood back to admire the first Christmas tree he had since he was four years old. Already off-balance because there was only one side to the tree, the weight of all the decorations slowly toppled the tree. They stood and watched as the beautiful Christmas tree came crashing down. Jimmy cried and cried. He was, after all, still a young child of nine and it was too much to watch his hopes for a “normal” Christmas come crashing down. Sometime in his teen years, he was ready to be released. His sister wanted him to live with her. The authorities disagreed. She now had a family, with two young children of her own. The authorities felt that Jim needed to be with someone trained to handle “troubled” kids, someone more mature, that could understand a teen-age boy. But Sis insisted that he needed the love of his family. And so Jimmy was released to her care. He adored her children, and they adored him. But it wasn’t long before his anger and his troubles brought turmoil to their home. He stole from them. He lied. Indeed, the authorities were right, the young couple did not know best how to deal with his issues. His sister loved him, but couldn’t put her family at risk. She too, after all, was fighting for a normal life. And so Jim was incarcerated again. Only for a short time, and then he was released to his dad. At 17 years old, he was working a summer construction job. He was 40 feet above the ground, placing beams in a steel frame of a soon to be high-rise building, when the beam fell. Instinctively, he reached for the falling beam, and as he did so, he tumbled off the beam. On his way down, his head hit another steel beam. He hit the ground, and the force of the fall caused his body to bounce back up in the air and hit the ground again. He was air-lifted to the trauma center, where upon arrival he was so badly swollen from head to toe that he had no facial features, and they could not determine his age. The x-ray of his skull looked like a jigsaw puzzle, his skull shattered like a clay pot. His hips, his legs, his arms were all broken. But would he survive the head injuries? Jim was a fighter and a survivor. In a coma and hospitalized for months, he fought his way back to life. His memory and his spatial judgment are forever affected. He will never be able to work or drive. As a young man who finally had freedom and was trying to build a life for himself, he was now angrier than he had ever been. He had years of reconstructive surgery ahead of him, to rebuild his face, his arm, his hip, his leg. It is perhaps not surprising that his next obstacle in life would become a prescription drug addiction. Too bad all the physical therapy didn’t include emotional support and someone to watch over the prescription drug use; but that was 20 years ago. One can only hope things are different today. Today Jim is 43 years old. He sits in an Arizona prison, a place he has called home for most of his life. Oh, he has been released a few times, only to face the same issues on the “outside.” Still not able to work or drive, what else is there to do? It is only a matter of time until he finds his way back to the drugs. Most of his time in prison is in protective custody. No one comes to visit him, he has never made friends outside of prison. He gets angry at times and punches himself in the face. He writes to his mother, with requests and tales that are childlike and absurd. One wonders if he has any sense of reality at all. This Advent season, I will do something I have never done. I will attempt to visit someone in prison. I have helped to feed the hungry, I have welcomed strangers, I have clothed the needy, and cared for the ill. I have never visited someone in prison. The thought creates a physical reaction in me. I have been around juvenile institutions and just remembering those visits makes me cry, makes my stomach twist into a tight ball and ache. And truthfully, over the years I have developed a “tough love” approach to prisoners, reasoning that they are there because they deserve to be. They are adults, they made their choices, and now they can pay the consequences of their choices. Indeed. As I write Jim’s story, I stop every few sentences to cry. To cry for the sweet innocent boy who loved to make everyone laugh and who never really had a chance in this life. This Advent, I am going to attempt to visit Jim. Attempt because I have to go through a process to visit a prisoner that could take 60 days. Please pray for Jim and please pray for me, for you see, Jim is my little brother, whom I have not seen in years. This Christmas, let us remember all lost children in our prayers. Jim and Jean in a light-hearted moment before the tree crashed. 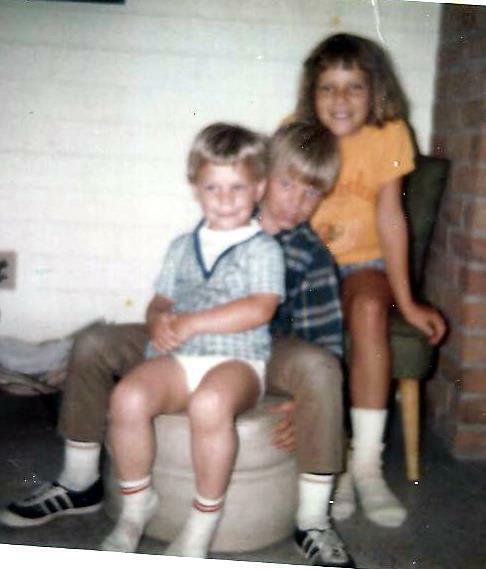 Jim (in front) with our brother and sister. This picture was taken shortly before we were abandoned. 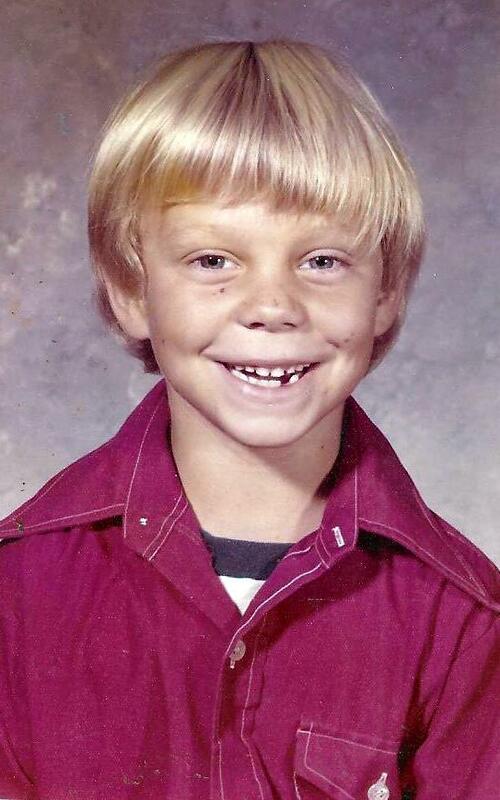 Jimmy before he became a prisoner at eight years old. All I am able to say is wow! Thanks MaryAnn. Knowing that you’re praying means the world. The pictures of Jimmy REALLY highlight your story. You are amazing! Thanks Pat for the kind words. The pics were cool to find, I didn’t remember having one of the “tree” until I went looking for a picture of Jim. Jean please know that I will keep you and your family, especially your brother, in my daily prayers. Your life story is nothing short of amazing. You are such a great speaker. I think God might be calling you to share your story with the world. Thank you Monica… for the kind words and all the love. It is so greatly appreciated. I really want prayers for my brother, I am struggling to find Jesus in Jim’s story. I know he’s there…. this might be my next blog. Jean, I am a fellow parishioner at St. Gabe’s and somehow was led to your wonderful blog. You are such an inspiration and I see the works of God through you. Thank you for sharing your gift of words. If I wouldn’t have known, I would have thought that this was from a book. Your life story is amazing. Thank you for your beautiful example of love to one another. I will be praying for you both..
Linda, so nice to meet another St Gabe’s parishioner! Thank you for the kind words and the prayers. I didn’t realize how much they would mean to me, but they mean everything. Very powerful, Jean! God bless you and your family through this Christmas season and throughout the coming year. I just now read your story and it really moved me to tears. You truly are amazing and because of your own experiences, you give strength to others. You are an inspiration to all of us. God bless you and your family! I had often wondered why some are able to rise out of the fire while others remained. When reading your story, a thought came to me: The Lord supplies us with ALL that we need, does He not? He blesses some with a talented mind, the ability to think and create; some are blessed with sturdy, stable hands to build and operate. Esentially, He provides us with tools to do His good works.